Two decades of ethnic tension and a civil war in 1990 laid the groundwork for one of the most savage episodes of wanton slaughter witnessed in the past half century. 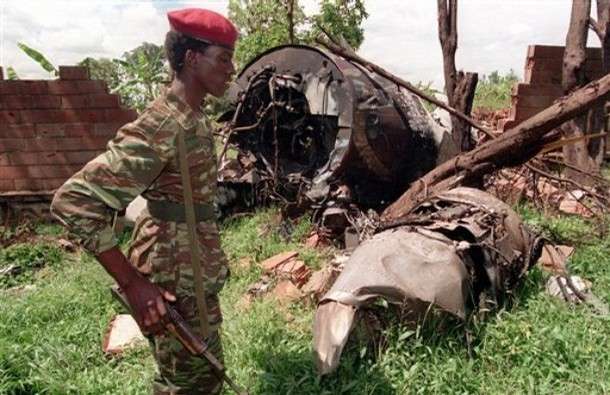 The day after the airplane carrying Rwandan President Juvénal Habyarimana and the president of Burundi was shot down, the Rwandan military responded to the deaths of the two Hutu presidents by starting a murderous campaign to eradicate all the Tutsis they could reach. 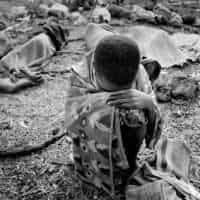 Thus the Rwandan Genocide began on April 7, 1994, as hundreds of thousands of innocent people were massacred in only a few short months. Robert Gribbin, Ambassador to the Central African Republic at the time and Ambassador to Rwanda in 1996, and Joyce Leader, Deputy Chief of Mission in Kigali from 1991 to 1994, recount the background of ethnic hatred that led to the explosion of violence, their experiences as the genocide broke out, and the massive evacuation they had to oversee to get foreigners out of the country. Gribbin and Leader were interviewed by Charles Stuart Kennedy in 2000 and 2003, respectively. After its victory in July 1994, the Tutsi group the Rwandan Patriotic Front organized a coalition government similar to that established earlier by President Habyarimana. The first post-war presidential and legislative elections were held in the fall of 2003. The current government officially prohibits ethnic, racial and religious discrimination and has passed laws prohibiting emphasis on Hutu or Tutsi identity in political activity. Rwanda observes Genocide Memorial Day on April 7; the following week is designated as an official week of mourning. To read about the frustrations of dealing with inaction from Washington, see Prudence Bushnell’s excerpts, A Soul Filled with Shame. GRIBBIN: Rwanda’s genocide occurred in April of 1994. This genocide was a political crime. That is, it was a conscious decision by some of the ruling elite who were Hutu to solve their political problem, personal power problem and their economic problem by killing the opposition, and by this they meant not only the Tutsis, who were a minority in the country, about 15 percent of the population, but also political opponents who were Hutu…. LEADER: Throughout the three years that I was there, mini massacres were happening. No massacre should be minimalized by the word “mini,” but I say that because in comparison to what happened in 1994, these were killings that went on that were geographically isolated or restricted. They didn’t spread. Maybe 300 people would be killed. It was always 300 people. Then it would stop. Nobody would ever know quite why it started, who started it, what was the impetus, and so on. These things would flare up in different places. Then they would go away. The government would blame it on the RPF [Rwandan Patriotic Front, at left], who would blame it on the government. There was a lot of insecurity at the time, too, because bombs were exploding in marketplaces and on buses. Land mines were run over by trucks on roads. So who was doing all of this was never quite clear. There was never any accountability. Nobody was ever found responsible for this insecurity and for these massacres. In some of the massacres, I have to say that it didn’t seem all that unclear to us that the government or people close to the government were serving as agents provocateurs. 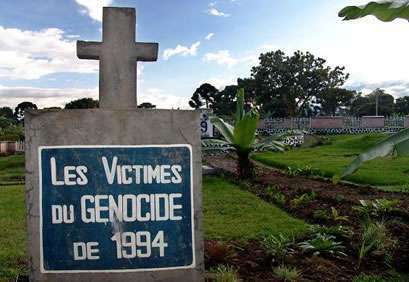 The first massacre that happened when I was there was south of the capital in an area where there were a good number of Tutsis who had been resettled from other parts of the country some years back. There were indications that people were going around and saying that the Tutsis were going to kill them, so they had to defend themselves and act before the Tutsis did that. That was usually the line that was taken, that if you don’t kill the Tutsis, they’re going to kill you. It was this kind of fear that prompted people to pick up their machetes and execute their neighbors. But did we think that this was going to escalate into something worse? I guess we were maybe naive but I don’t think my mind could imagine such a thing. It just couldn’t fathom that that would take place. We did at the embassy keep our focus on the positive developments, what we thought were positive developments, in terms of the peace process and democratization, strengthening the political parties, helping to facilitate the negotiations between the rebels and the government when that got started…. GRIBBEN: Certainly, ethnic animosity generated the hatred necessary for this. There is a long history here, which I’ll briefly recount. Prior to independence Tutsis were on the top of the social and economic pyramid. They had ruled and, in some ways, oppressed the Hutus for generations. At independence the tables were turned, the majority Hutus came to power and began a systematic repression of Tutsis, expelling some and killing others. Hutu leaders learned that they could make political hay by going after Tutsis. Before long this became an institutionalized part of politics in Rwanda. In 1990, a Tutsi exile army invaded from Uganda and tried to reclaim a national role. The invasion was thwarted by a combination of French, Belgian, and Rwandan troops. Ultimately the matter ended up in Arusha, Tanzania, where a series of negotiations ensued designed to create power-sharing arrangements, which would give everybody a piece of the action…. However, there were no provisions for the “kitchen cabinet,” the insiders, the men around President Habyarimana, who stood to lose everything – lose their position, lose their power and lose their ability to steal from public coffers, direct contracts their way, etc. They began to see, we think, that Habyarimana was selling them out in order to secure his position so that he might continue as president in the new power-sharing government. This group was called the Akuzu, and they were essentially his brothers-in- law and other relations of Habyarimana’s wife. They began then to think in terms of genocide. Actually they took a couple of practice runs at it. In 1991, and again in 1993 they organized pogroms aimed at Tutsi residents in particular areas. Those deaths did not generate much of an international reaction and no internal sanction. From there plans expanded…. GRIBBIN: By January and February 1994, Habyarimana was under intense international and internal pressure to implement power-sharing decisions that had been negotiated and accepted at Arusha a year earlier. The president went to Tanzania in April of 1994 where he, in fact, agreed to implement the remaining provisions that would permit this power-sharing to go forward. Elements of it were already in place. There was already an RPA (Rwandan Patriotic Army) battalion in Kigali protecting the Parliament, where there were RPM (Rwandan Patriotic Movement) members of parliament. So some of the elements of the power-sharing were already in place. 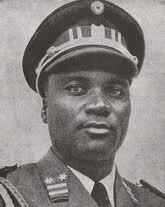 But in any case, Habyarimana agreed to complete the process. On the evening of April 6 as his plane was landing again in Kigali, it was shot down. The president and all aboard, including the president of Burundi, who was hitching a ride, were killed…. Obviously the shooting down of the airplane became the signal for the genocide to burst forth. It started that night. The plane was shot down about 9 PM. Interahamwe militiamen were on the streets shortly thereafter with their lists, looking for in the first instance for Tutsi and Hutu opposition politicians who were in town – they were the most accessible – to kill. The killing started that night and as the Hutu opposition politicians were eliminated, the genocide expanded and took on a much more racist tone. LEADER: I awoke to gunfire. I think others did as well. I was getting calls from 7:00 AM telling me that the political moderates who were in the opposition to President Juvenal Habyarimana and who favored the peace accord were being systematically killed. I knew there were forces going house to house in some of the Kigali neighborhoods killing Tutsis. Right off the bat we had the killing of the Hutu moderates, not just Tutsis, and also ordinary Tutsi citizens were being slaughtered. That was evident before 10:00 AM. By that afternoon, we were hearing that the RPF might start to move its forces down from the north. There were rumors that forces already in the area were breaking out of the compound they were in, but I don’t know to this day if that was true. But forces did start moving down from the north. By the next day, it was clear that Kigali could become the venue not only for killing Tutsis and killing Hutu moderates, but also renewed civil war, which had not happened in Kigali up to that time. So, we decided, and Washington decided, that it would be best if we evacuated…. The shooting down of the plane was the trigger that started the actions of the groups who were trained in the capital to do a very rapid and brutal killing with what they called “les armes blanche,” not even guns, but machetes. In fact, in one of the stories which I don’t think is a story, people were actually paying to be killed by a bullet rather than to be killed by a machete. It was horrendous. Whether the violence would have been launched by some other trigger, my feeling is, yes, it could have been a different trigger. But it just so happened that the president’s plane became the trigger for launching the genocide and killing the opposition and renewing the civil war…. GRIBBIN: Exhortations to kill Tutsis were broadcast over Radio Mille Collines, which was a popular “hate radio” station. The well- organized militia began systematically to slaughter Tutsi not just in town but also in rural areas. In face of the violence Tutsis began to gather at places of refuge such as churches or local government headquarters, where traditionally they gained protection of the priests in the case of the church or burgomaster, who was in charge of the district, or the préfet. However, this time refuge did not work. 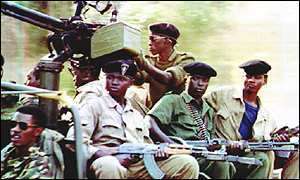 Instead, local militia would ensure that a firm ring was set up to contain the Tutsis. Then they would call for the Interahamwe who would come, throw a few hand grenades into the church to panic and terrify everyone. Then the killers would wade in with machetes and clubs and kill everyone. Those who survived these terrible massacres were generally people who were wounded but who fell and stayed under the bodies of the dead that lay on top of them. LEADER: It was not too late for intervention. Immediately after the killing started our policy was to call for the killing to stop. Once the civil war was renewed we urged renewal of the cease-fire and an end to the fighting. So, it was stop the killing, stop the fighting, let’s get back to talking. But at the same time, there was the issue of the UN force that was already in the capital. 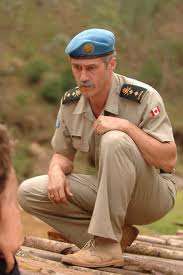 There were approximately 2,500 troops under the aegis of the United Nations headed by a Canadian general, General Romeo Dallaire. His rules of engagement forbade him to initiate any kind of action against the people who were committing the killing. He could only respond if his troops were directly threatened like if somebody raised a gun and pointed it at them. Otherwise, they could be standing right beside a checkpoint and people would be committing crimes, killing people, but they couldn’t do anything to stop it…. GRIBBIN: The genocide was organized to involve as many people from the Hutu community as possible in the crime. Thereafter, everybody would be implicated so no one would be able to call others to justice. By and large, this theory worked fairly well. It worked well because Rwandan culture had a strong tradition of discipline. People did what they were told. When leaders told them to take up arms and kill their Tutsi neighbors or turn them in or point out where they were hiding, promising in many cases their land or their goods or their women if they did this, they complied. There was enormous peer pressure to participate. Sanctions – even one’s own death for refusing – cowed all but the most resistant. Estimates are that maybe as many as half a million Rwandans participated in some fashion or another in the killings. The upshot was that this was a very “efficient” genocide – if you can use the term: more Rwandans died in a shorter space of time than the Germans had ever managed to kill during the Holocaust. In about six weeks or seven weeks, almost a million people were killed, and almost all of them at close quarters. LEADER: Our mission was gone. The embassy was closed. The French were gone, the Belgians were gone, the U.S. was gone, the Africans, everybody was gone. All of the diplomats had evacuated. I believe that a couple of Tanzanians actually stayed at least for a while to try to get things back on track. But pretty much everybody left. So it was really Washington that was operating now. There was very little intelligence coming out of the country because nobody was there to provide it. We were in touch with people who were in the country and certainly our Deputy Assistant Secretary [Prudence Bushnell] was talking by telephone regularly with the people who were running things…. It seemed that without some kind of military assistance, we couldn’t get to the airport because we would be crossing battle lines. If we went with the French, they were considered pro-Habyarimana government. If we went with the Belgians, they were considered pro-RPF. So we thought that maybe we had a better chance of being independent. We finally assessed that our best shot was to take the road south to Burundi. At that time, the killing had not spread south of Kigali. There were reports of killings north and east but not really south. We had already identified assembly points. Because we had been having security briefings regularly with our community, other Americans knew where those assembly points were. We couldn’t discuss anything without involving everybody because we were using our two-way radios. Everybody could listen in if the ambassador and I were discussing something. If the embassy people were discussing, everybody was listening. So they all had a say from their perspective about what looked best to them. They all agreed that it was best to just go by road. We spent a lot of time trying to get some sort of authorization from the government side to give us safe passage and we succeeded. It just so happened that our defense attaché was there. He and our consular officer made it to the embassy on Friday, two days after the plane was shot down. They managed to get a commitment of safe passage and a couple of gendarmes to accompany any convoys out of town. The decision was made on Friday morning that we would evacuate and we only had that day to organize. By that time, most of the people in the mission – AID, us, missionaries – had lost power. We could only have electricity if we put our generators on. That meant that to recharge the radios, we all had to have the generator on. Some Americans were caught in a crossfire on Thursday night, so they really did feel that it was time to get out. We think this particular crossfire, by the way, was internal fighting between branches of the military inside Kigali at that point. 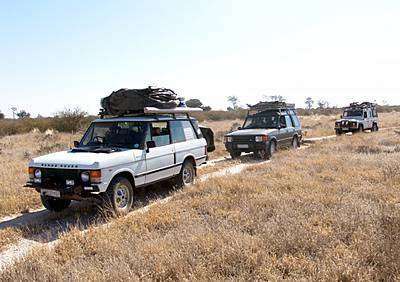 We sent two convoys on Saturday and two on Sunday and they all made it safely to Burundi. Some of them had some stories and it took them quite a long time past midnight to make it all the way there, but they did. On Monday the first convoy went. The Ambassador’s wife was in that convoy with their car and there was some concern that they wouldn’t be able to get across the bridge out of town, that it might have been blown up or something. They went anyway because how could we get any intelligence unless we went? So, they went down there and they found that it had not been blown up and it was still passable, so they went across and then about 1:00 PM, our convoy, the last convoy, went. I closed the door of the embassy and we left. The Ambassador and I were in the last car of the last convoy until we got to the bridge and they told us we had to be the first car. We had a 107-car convoy. I counted them when we got to the border. Of those 107 cars, there were only nine Americans. There were Omanis, there were all of the African diplomats, there were a number of Germans, some other European governments that weren’t Belgian or French. It was slow going, but we made it with no serious incidents…. LEADER: We were in touch with some of our Foreign Service nationals who worked for us and told them what we were doing and what arrangements we were making for them to continue to be paid and that we would be coming back as soon as possible. But they were mostly in their homes or in hiding. We had no way of taking them with us. It was very distressing, but we didn’t. It was something that we didn’t like having to do, but we did have to do it…. So that was a big issue and it caused a lot of Americans anguish, because they had to leave behind people who worked for them in their homes, people that they worked with in their places of work whether they were in UN organizations or in the embassy or in AID or whatever. We all think about that a lot. GRIBBIN: When I looked at Rwanda after the fact, I saw intact buildings and intact houses – it didn’t resemble a war zone whatsoever. However, plentiful evidence of genocide was found in the killing places where thousands of skeletons, desiccating bodies, skulls, and bones were stacked in profusion. A number of these gruesome sites have been preserved as memorials to the horror.